Leaving the old school grounds we go left and face for Hearnsbrook. The new parish school, Scoil Náisiúnta Iomair, is on the right, outside the village, on the Loughrea road. 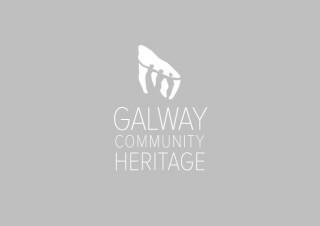 It was officially opened by An Taoiseach, Enda Kenny and blessed by the Bishop of Clonfert, Dr. John Kirby, on May 24th 2013. In addition to the usual classrooms this building contains a music room, a library and museum, rooms for occupational therapy and for learning support and resource teaching, offices and staff room and a recreation hall. The hare looking through the telescope. The Inquisitive Hare, on the school grounds, will attract your attention. This sculpture was designed and created by Donncha Cahill, in consultation with the school staff and pupils. In his Proposal Donncha stated “the hare looking through the telescope represents the quest for knowledge and information, while also acting as a guardian for the school and the Killimor area. It makes reference to the area and the scholars and pilgrims that may have travelled across this highway, and the stories and experiences they brought with them.” The hare stands on a stack of books and the books incorporate simple designs along the spines, which were suggested by the pupils and teachers. 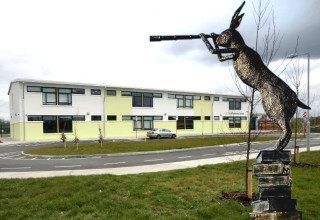 The base, on which the hare stands, has additional designs which were devised by the pupils.